TAKING A ROADTRIP TO THE SANDIA CREST? Providing the best service for your vehicle. The Mechanic Inc. Offers Auto Repair Services You Can Count On! 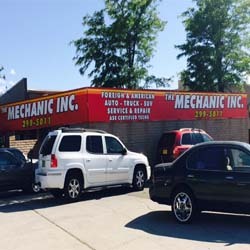 Since 1976, The Mechanic Inc. has provided motorists in the Albuquerque, NM 87111 area with comprehensive auto repair services that include 4x4 Services, Alignment, Brakes, Car & Truck Care, Domestic Cars & Trucks, Electrical Services, Electronic Services, Engine & Transmission, Engine Maintenance, General Services, Heating and Cooling Services, Import Cars & Trucks, Inspections and Emissions, Miscellaneous Services, Quick Lube Services, Tires, Towing, Transmission Services and Undercar Services. Our goal is to offer the best services available at affordable prices to get you back on the road in no time. For a high-performing vehicle, trust The Mechanic Inc. with your car, truck, or van. To learn more about the services we offer, please contact us by phone at 505-299-5011 or send us an email. We also invite you to learn more about our dedication to you, our valued customer. My experience at Machanic Inc today was awesome. Chuck, the owner, was so friendly, professional, and kind. The mechanic was wonderful and helpful. They didn't charge me for figuring out that I wasn't using a switch right. I will use them for everything from now on. These people were great. We had a minivan looked at for a pre purchase inspection and man were they thurough. They looked at almost everything. I was told of any problem or even any potential problem with my van. Because of their evaluation I got the price of my van knocked down $500 in addition to new brakes, some free body work and some free mechanical work. To get this work done on my own would have cost around an extra $1,500 bucks. So as I see it, getting the $80 plus tax inspection saved me $2,000 or so. Also, they told me over the phone it would be about a 3 hour inspection, but they got it done in an hour because they knew we were waiting to buy it. I only had a question. The mechanic who spoke with me was extremely helpful. No asking for payment just honest. For a person who isn't well inclined with engines he gave me a straight to the pin answer. If I ever have anything that I can't do I'll head directly here. Honesty obviously means more to them than taking your money. Otherwise they would have asked for money like every one else did. Thank you. Took my car in when it wasn't going like it should. They are friendly and let me know what was happening, and more importantly how much it was going to cost, every step of the way. Dealing with Chuck was an enjoyable experience. We are in a pinch and he got us in that day. He was very transparent and we were in and out. I would highly recommend him! We are from Taos and if I had a choice I would drive down just to have him as my mechanic. Another year gone by and The Mechanic Inc continues to provide trustworthy and affordable automobile repair service. It simply does not get any better than this! Mechanic knew exactly what was wrong with my car as soon as he heard it running, and was extremely forthcoming and honest about what the problem was, how serious it was, and how it would be fixed if that was what I chose to do. Everyone I encountered was very friendly and polite. It also seems like they have some of the lowest rates in town for the initial inspection to determine the exact nature/extent of your problem. Highly recommended. Excellent service! Highly recommend! Was in a bind, having car issues during a road trip. .. Chuck made time to help me out and was honest and sincere throughout the whole ordeal. His son was also helpful, and wife very friendly. Good family, good service, good price.